To get a good sear on your steak you need to crank up the heat, but don't worry, the CAVALIERE 36w in. Wall mounted range hood will take care of the smoke. 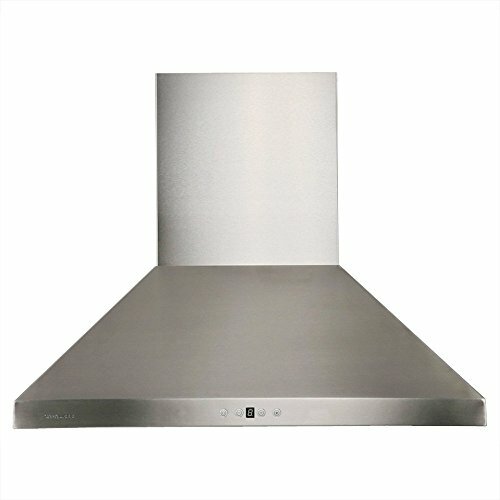 This wall-mounted range hood is effective, efficient and stylish. It's made of quality brushed stainless steel with a whisper quiet single chamber motor and dishwasher-safe, premium stainless steel baffle filters. Two halogen lights offer excellent task lighting and the touch sensitive keypad makes it a breeze to use. Additional information: 6 speed levels, touch sensitive keypad with LED lights, dishwasher-safe stainless steel baffle filters, airflow: 860 CFM, two 35-watt halogen lights. About CAVALIERE: CAVALIERE offers a complete stainless steel range hood collection. They blend superior components with the latest technologies to create range hoods that cater to your needs. CAVALIERE has a special understanding of the kitchen environment, ergonomics, aesthetics and integration within your home or workplace. They specialize in wall-mounted, island or under cabinet range hoods that make a statement in your kitchen.